Otome Gamer's Problems - the List. Re: Otome Gamer's Problems - the List. I kind of got curious about what people think of the Do-S trend. a problem I have: liking the heroine/protagonist when the rest of the fanbase seems to hate her for one reason or another. also the fact that not a lot of guys are into otome games, so I get weird looks when people learn I like them. - Some protagonists are so clueless that she doesn't know when the guy is flirting with her or hes in love with her. Super annoying. - Too much otome gaming makes me wish some of the animes I watch were made into one just so I can choose which guy to end up with. LeKitten wrote: - Too much otome gaming makes me wish some of the animes I watch were made into one just so I can choose which guy to end up with. +1 for this. Reverse harem anime has been practically ruined for me if there isn't an English otome game available for it. I sit there virtual-table throwing through the episodes because the MC isn't making the right decisions. I say practically ruined because, hey, eye candy. I'm sure many people ave mentioned this already but, one thing I can't stand in otome games is lack of customization. Is it so wrong to want the heroine to look a little like you?! One game in particular I thought would have customization was Tokimeki Memorial Girls' Side, but there honestly isn't that much. I love the idea of playing dress up with the heroine but I wish the cutscenes where you see her (if you even can see her, some games want the heroine in the CV's as little as possible), she was actually wearing the outfit you picked out for her. I know Custom Drive does it for the guys, and it's honestly something I'd like to see more of, just gender flipped. That and maybe a little customization of the heroine herself. Maybe picking between short hair and long hair, different hair colors, eye colors, skin tones, that sort of thing really. I still love otome games but I feel they would be more inclusive if small touches like these were added. 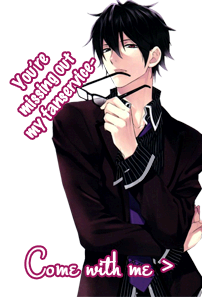 Lekitten wrote: Too much otome gaming makes me wish some of the animes I watch were made into one just so I can choose which guy to end up with. Lol, I totally agree with these statements. I remember I stopped reading Fruits Basket in high school because I didn't like the way Tohru picked Kyo. And I hated the way Miaka chose Tamahome in Fushigi Yugi. Almost a decade later, I still throw rage fits whenever I watch the animes. Good thing they came out with a Fushigi Yugi otome game! # 12. When you feel guilty about trying a new romance route because it means neglecting a character whose route you already finished and you just know that he's lonely in this version of the story. the room, and you have to hide the screen to not embarrass yourself. # 30. Missing that ONE EVENT that unlocks the End you wanted. # 48. When you just finished Boy 1's route and are going for Boy 2 and even though you know if you're nice to Boy 1, you'll just get his ending again, you don't have to will to be a jerk to Boy 1. He already has a special place in your heart. Upon reading this, I just thought of how cool a Shingeki no Kyojin one would be. Given that women are portrayed better in SnK than in most anime, manga and otome games, the protagonist could be very interesting. Also, the plot would be very much unlike most of the otome games on the market. I'm sick of Japanese companies thinking that just because most otome gamers are girls, it means that we don't want more dark and action-packed plots! Anyway... who wouldn't want to hook up with Levi, his disappointing 160cm height be damned! Sleep with one eye open if you go for Eren, hahaha... Actually, I'd like a Mikasa route, though it would take epic writing for that to make sense. The second playthrough after the MC has found true love and shouldn't be going back in time to cheat on him. #?? When you have to choose do-M choices for the douchebag do-S jack-a$$ because you're too obsessed with "completing" the game to ignore his route! *Ahem* anyways... I've updated the list on the front page. Like I said I would! Still not totally perfect, but at least 500% better than before. I know there are a couple mistakes in the new list post but just pretend they aren't there for now. #78(? ): When the guy you didn't even consider in the beginning is suddenly the most interesting character...when you're on another guy's route and you can't change your mind ("WHYYY??"). #79(? ): When the guy you chose is awesome in all of the routes. Except his own. #81(? ): When there is no way to figure out what the fr*** the game wants from you without a guide ("Oh, you didn't get his good ending? That's because on day 27 you were supposed to go out for a drink with the archenemy who killed his parents . Yes, it's obvious. ").